Blend together and enjoy! you may also choose to add one tsp spirulina or for a little extra sweetness a couple of drops of stevia. Parsley is one the most popular herbs in the world, and although many chefs use it as a garnish, parsley promotes optimal health because it is a rich source of anti-oxidant nutrients that are great for our heart! Parsley helps protect against rheumatoid arthritis, with its amazing anti inflammatory properties. Parsley is also easy to enjoy by combining with quinoa or bulgur wheat, chopped green onions, mint leaves, lemon juice and olive oil to make a delicious tabouli dish. Add parsley to pesto to add more texture and green color. Use parsley in soups and sauces or add to salads for extra vibrant flavor & beautiful green color!!! Hope you are all having a healthy & safe holiday season! Rawsta with Tapenade & Rawmesan is the best! Its so delicious most people don’t even realize they are eating raw and nourishing their bodies with optimum nutrition! Spiralize or julienne 3 or 4 medium zucchini. If you would like you could make it the consistency of cooked pasta by adding a touch of olive oil and salt. Place in food processor, blend until you reach desired consistency. Tapenade: Chop up Olives, Red peppers & Mushrooms. Marinate in tamari & olive brine… serve on Rawsta or crackers…. its such a good savory topping! Rawmesan: Nutritional yeast, ground up sunflower seeds, and herbs and salt to taste. Garnish Rawsata with oregano or parsley and serve! Enjoy this day & this recipe! I love miso from South River Miso Company, It is simply magical and they even have both soy-free and gluten-free varieties that are simply divine! Contains all essential amino acids, making it a complete protein. This in turn helps preserve beautiful skin – miso contains linoleic acid, an essential fatty acid that helps your skin stay soft and free of pigments. Antiviral — Miso is very alkalizing and helps strengthen the immune system helping to combat viral infections. Restores beneficial probiotics to the intestines. Aids in digestion and assimilation of other foods in the intestines. This happens by stimulating the secretion of digestive fluids in the stomach. Helps maintain nutritional balance — full of nutrients beneficial bacteria and enzymes, miso provides protein vitamin B12, vitamin B2, vitamin E, vitamin K, tryptophan, choline, dietary fiber, linoleic acid and lecithin. Strengthens the quality of blood and lymph fluid. Reduces risk for breast, prostate, lung and colon cancers. Protects against radiation due to dipilocolonic acid, an alkaloid that chelates heavy metals and discharges them from the body. Strengthens the immune system and helps to lower LDL Cholesterol. Anti-Aging — high in antioxidants that protect against free radicals that cause signs of aging. Miso also helps reduce menopausal complaints because the isoflavones in the miso have been shown to reduce hot flashes. As you can see, Miso is magical, it has a sweet, earthy, fruity, savory, and salty flavor that can be used in a variety of recipes. 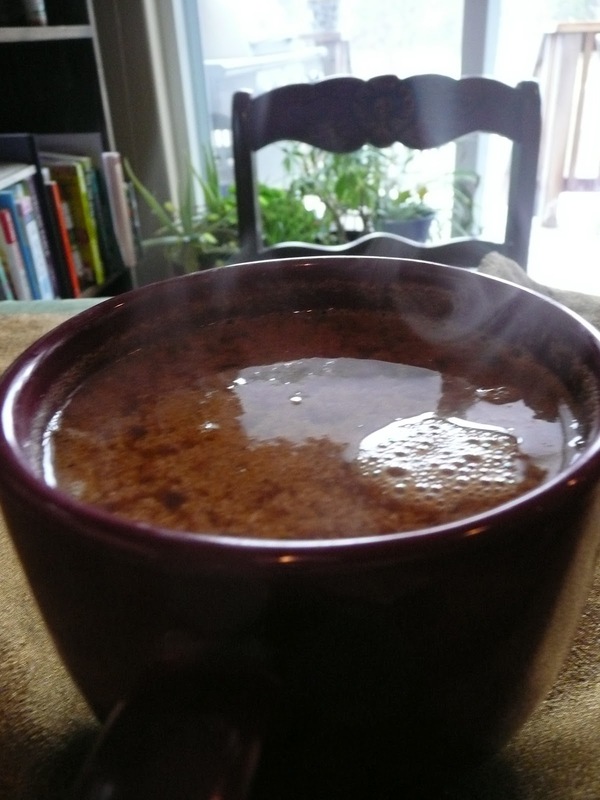 Miso can be used as a dairy substitute in place of milk, butter and salt in creamed soups. Unpasteurized miso used in marinades tenderize meat and vegetables by helping to break down fibers. (I personally like it on asparagus). Use miso in a casserole or soup supplies plenty of high quality protein. Sautee onion and any other veggies you desire. Heat water in pan. Add Miso and Tahini, stir. Add onion and dash of cayenne. Its also delicious with sea vegetables like cut up nori or wakame. Serve! Many of you may notice that I use cayenne a lot. I do this because my body constitution is generally cold, and cayenne helps increase circulation. It is also known in many cultures to be a potent libido enhancing aid that increases euphoric endorphins in the blood stream. How exciting! Cayenne is also relatively high in Vitamin A, vitamin B6, Vitamin C, riboflavin, potassium and manganese. It’s snowing here in Whitefish, Montana today so I decided to make soup to keep me warm and toasty! Blend in blender, serve! It is wonderful tossed in salad, garbanzos or quinoa. Stir miso into veganaise and use within 1 week. Dip yam fries, use on sandwiches, use as a sauce/dip for veggies. Blend soaked cashews and blessed water into a creamy mixture. Combine Cream, melted coconut oil, miso and coconut sugar in blender and blend until smooth. If the sugar is not blending well, it might be helpful to place mixture in a saucepan on stove. Place on low heat and stir until sugar dissolves (probably about 5 or 10 minutes). 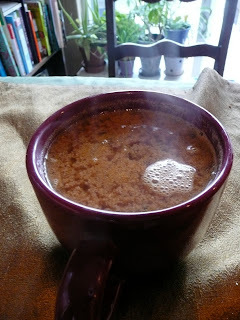 Add more coconut sugar if needed or even a touch of maple syrup or honey for a truly rich flavor. This mixture is delicious over poached pears and apples as well as cabbage, eggplant or even over a sorbet. What is your favorite miso recipe??? Since I live in Montana, and its cold and snowy outside this time of year, I long for warm beaches and sunny clear skies. But in the mean time I can create my own tropical hideaway in my space by cranking up the heat, practicing yoga and making myself a delicious Greeña Colada! Put all ingredients in a blender and blend until smooth! Pineapple is a great digestive aid because it helps the body break down and digest proteins more efficiently. The enzyme in pineapple that is so amazing is called Bromelain, it is an excellent anti-inflammatory. If you eat 1/2 cup of pineapple a day it is said to provide pain relief by helping to relieve painful joints common to osteoarthritis. In sports medicine, bromelain is used to reduce inflammation and swelling after an injury. Pineapple is also known to help dissolve blood clots and is an old folk remedy for morning sickness. So go ahead and drink up your Greeña Colada! I am on day 15 now of my personal yoga challenge and for some reason when I think of yoga, I naturally envision a beautiful healthy person, bending their body into amazing poses or maybe I just assume that everyone is able to touch their toes without bending their legs. Well, my friends, this is certainly not me. Everyday I can feel my body stretch a little more as I practice but resistance is futile. What is this resistance? Will I ever be able to release this resistance? Is it structural or functional resistance due to my life patterns? So I have really been trying to take the time to breath through this and listen to my body as I ease into a posture. Or sometimes when I don’t want to physically participate in a posture, I imagine myself doing the posture. When I do this it actually empowers me to keep going & keep breathing. With every yoga pose (asana) I experience I have the opportunity to explore my body by applying more or less effort, cultivating balance and flexibility. Involving parts of my body that may other wise be dormant consciously moves energy and wakes up my body, opening myself up to a more subtle awareness. Even though I am not flexible and can’t even straighten my legs when I try to touch my toes, I continue on, movement by subtle movement. During this process I have also started to read the powerful book, A Course In Miracles: Foundation For Inner Peace. So far I am really enjoying reading about the meaning of miracles and doing the daily lessons. Miracles occur naturally as expressions of love. The real miracle is the love that inspires them. In this sense everything that comes from love is a miracle. Miracles are everyone’s right, but purification is necessary first. Miracles are a kind of exchange. Like expressions of love, which are always miraculous in the true sense, the exchange reverses the physical laws. They bring more love both to the giver and the receiver. Prayer is the medium of miracles. It is a means to communication of the created with the Creator. Through prayer love is received, and through miracles loves is expressed. Miracles are both beginnings and endings, and so they alter the temporal order. They are always affirmations of rebirth, which seem to go back but really go forward. They undo the past in the present, and thus release the future. So onward with my yoga adventure, with increasing purpose, process and practice!!! To continue on the smoothie craze…. here is another delicious recipe for you to enjoy! Place all ingredients in blender, blend it up till smooth and enjoy! Cinnamon is an amazing spice that has many superpowers used to treat colds, indigestion & cramps, improve energy, vitality & circulation. Its cold here in Montana, so cinnamon is a great thermogenic spice to add to our everyday routine! To read more about the health benefits of smoothies, click here! More tomorrow on my yoga challenge adventure! Smoothies are a great way to incorporate more fruits and vegetables into your diet to increase your overall health! If you have kids its easy to get them to participate in making smoothies by having them “experiment” with different ingredients, it also helps if you love making smoothies too because leading by example is the best teacher! Alkalizing to help maintain a proper pH level in your body. Now is a good time to try to make your own green smoothie! Try to stick to about 60% greens and about 40% fruit. Put everything in a blender and blend away! How’s that for a super smoothie? If you don’t have all of these ingredients, don’t worry about it, experiment, taste test, and most of all have fun with it! As we are falling into the winter months its important to build and maintain immunity naturally with diet, lifestyle and a proper supplement routine. I would like to share with you some of the steps I take to boost my immune system naturally. Immune boosting foods include ginger, garlic, tea, fresh juice, sweet potatoes, beets, winter squash, carrots, beans, miso, spinach, kale, swiss chard, celery, cilantro, parsley, berries, oranges, grapefruit, broccoli, cauliflower, almonds, olive oil, grapes and pomegranates. Add herbs to your diet like a echinacea tincture (1/2 teaspoon every half hour for a super immune booster – decrease dosage as you return to wellness), astragalus (I personally enjoy astragalus tea with honey and a 1/2 a lemon) and spices like turmeric. Click here to learn how Nancy makes an echinacea tincture to boost the immune system. Lifestyle is important when we talk about overall health!! Prioritizing exercise as well as rest is important to have a healthy physical body and mental happiness. Daily physical activity helps rid the body of toxins, increases our blood circulation and helps to lower stress levels. Walking every day for 20 minutes and having a simple cardio or weight training routine 3 or 4 times a week where you break a sweat is super important for health, longevity and our immune system. Its also important to drink plenty of clean water!! Read here for more information on water. How much water should I be drinking to boost my immune system and ward of illness and dis-ease? Since water is the principal chemical component of the body, comprising of about 70% of our body’s weight. It is important that we are all individually unique and require different amounts. A good rule of thumb is to drink half of your body’s weight in ounces of water everyday. For example, if you weigh 150 pounds, you would drink 75 ounces of water a day. Drink plenty of water and stay healthy this winter by following these simple tips!